Sam Stathis of Goshen is involved in the sport of harness racing and wanted to reinvent the sport in some way. So he commissioned Pine Bush High School to come up with a redesign of the sulky. A sulky is a lightweight cart with two wheels and a seat for the driver. It has no body and is pulled by horses for harness racing. The only requirement was that the design had to be American. 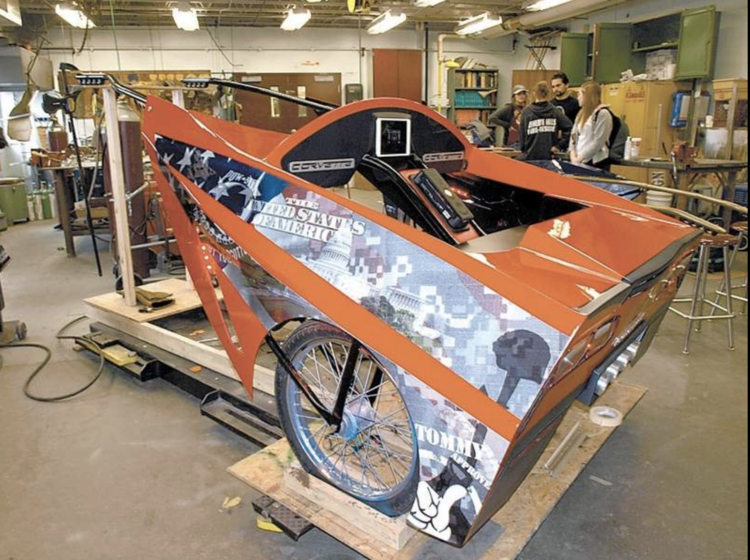 Students at Pine Bush High School were commissioned to redesign the sulky. So instructors Ken Marshall of the CAD class, Eric Johnson of the Science Principles class and Tim Jordan of the Energy Systems class gathered their students together for this unusual project. After one week of designing and four weeks of fabrication, the students created two sulkies like no other. One is themed after the 2012 Ford GT40 and the other is themed after the 2014 Corvette Stingray. You can’t get any more American than that. 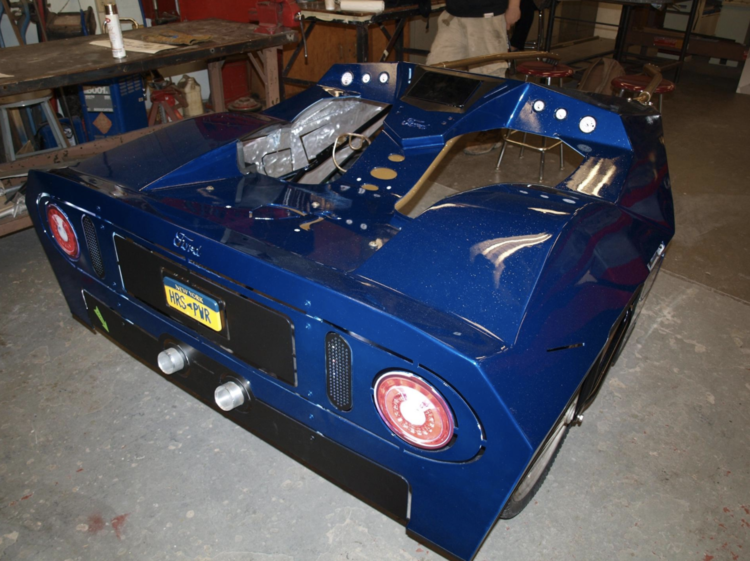 The Ford GT40 is a midnight blue with custom gold flake. The Corvette is a torch red. The removable aluminium bodies were painted by Lloyd Greer at his Pine Bush motorcycle shop, Lloyd’z Motorworkz. Cody Connelly of Paul Junior Designs helped cut out the designs and did some welding on the steel panels that make up the sulkies’ bodies. The students designed the American-themed graphics which were printed and cut out by Dickie Baxter, owner of Mixture in Montgomery. The students designed the sulkies’ bodies in the CAD system, the American-themed graphics, which were printed and cut out by Dickie Baxter, owner of Mixture in Montgomery, and even gave them a stereo system with speakers. LED lights, which are powered by a 12-volt battery, exhaust pipes and a place to mount your iPad were added. All the upholstery and the car emblems, which were cut out with a water jet, were also done by the students. A lot of the students from the high school and the Stars Academy put in late hours at the school to get the carts completed. Students from all grades and all ages worked together as a team to see their project to completion. “This project brought kids out of their shells,” Marshall said. Needless to say, Stathis was blown away when he saw them and the instructors were impressed with the students’ drive and eagerness to complete the projects. From the school they made an appearance at the Meadowlands Racetrack in East Rutherford, N.J., and then it’s off on a world tour, stopping first in Greece. Subscribe to become a harness racing insider!